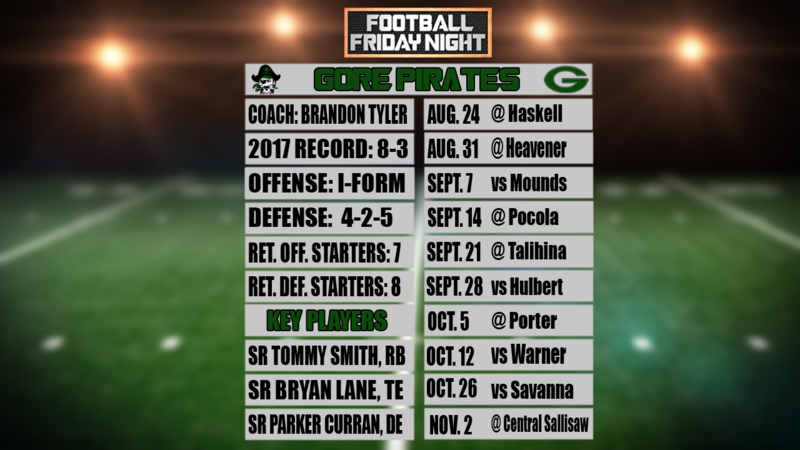 Gore, OK (KFSM) -When Brandon Tyler took over the Gore Pirates at the start of last season, he had one goal: to bring the program back to the Gore he remembered as a player. It only took three weeks to match 2016’s win total, and the team finished an impressive 8-3. Excitement around Pirate football is back. Kanton Washington says the excitement among the team is at an all time high. Success has provided more fuel to the fire for the Pirates. "It's heartwarming, it;s better than the last three years that I've played," says senior Bryan Lane. "It just gives us motivation really. I'm more motivated than I was last year." Tyler adds that the expectations are higher now, especially from within. "We set them as coaches, we want to be playing on Thanksgiving, and get to the semifinals and finals, those are the expectations and goals we have now every year. Having the success they had last year, they now feel they can step on the field with anybody. Tyler says the team still has strides to make when it comes to conditioing, and the team is starting a sophomore under center. But for the first time in a long time, there is a self-assurance around this Gore program. "Last year just gave us confidence," says Washington. "I feel like I keep repeating myself, but we're just so excited to play this year." The Pirates get that chance starting August 24th at Haskell.